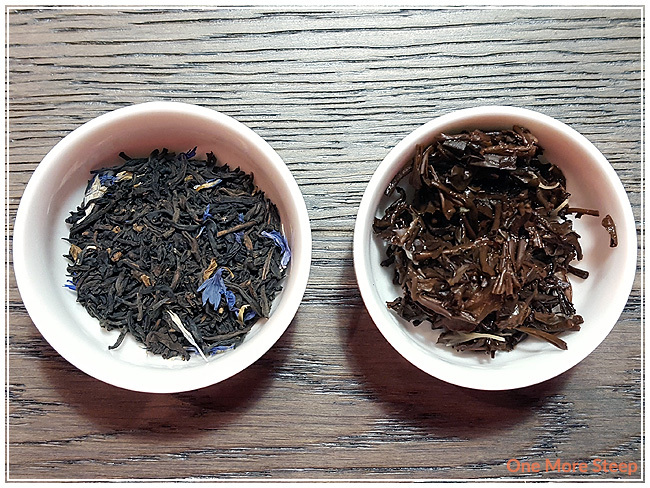 Blue Ambrosia by Tea in Texas is the third of the Tea in Texas trio of teas that I received for my birthday last year, and when I smelled the dry leaf, I was beginning to think that I had saved the best for last. Blue Ambrosia has this amazingly fruity smell to it. It reminds me a bit of pineapples and mango, so it wasn’t that big of a surprise to read the label on the bag that suggests that it’d be great for an iced tea. Blue Ambrosia is made up of: black tea, rose blossoms, cornflowers, safflowers, and tropical oils. I do wish that they had included what the tropical oils were, but alas, they did not. The steeping instructions for Blue Ambrosia are to steep in 212°F (100°C) water for 3 to 5 minutes. I opted to steep for 4 minutes. 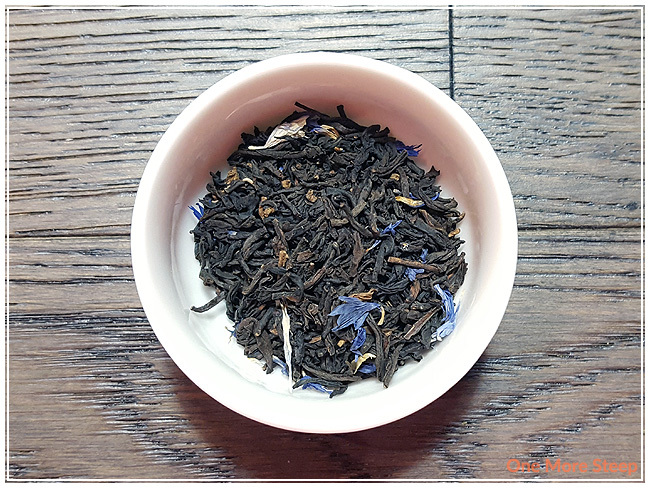 Blue Ambrosia steeps to a dark orange, with a beautiful fruity aroma. When tasting the tea, I found it to be smooth with zero astringency. The flavour of this tea has a sweetness to it, which I attribute to the flowers mostly. The tea is quite tasty, and I enjoyed the fruity flavours. I wish I knew which tropical fruits were represented in this blend, but it does have a great fruit flavour to it with a slight floral flavour. As an aside, Tea in Texas is accurate in this tea being a great iced tea. 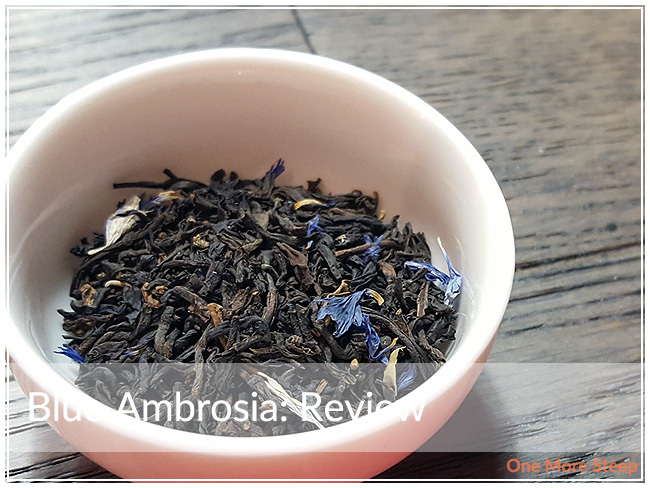 I resteeped Blue Ambrosia, and found that while that the floral flavours and sweetness were much stronger in the first resteep of these tea leaves. However, the tropical flavours were quite weak and mostly gone. I’d say that if you enjoy the fruity flavours, then Blue Ambrosia is good for one steep. I loved Tea in Texas’ Blue Ambrosia. 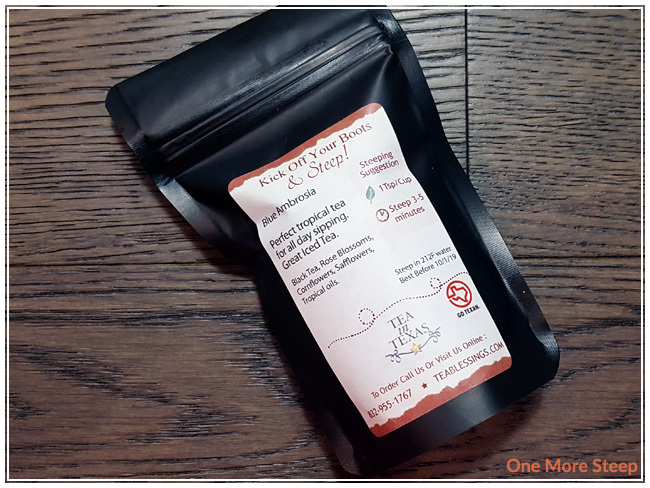 I really enjoyed the flavours of this black tea blend. I wish I knew what the fruity flavours lasted more than one steep, because that was one of my favourite aspects of this tea. 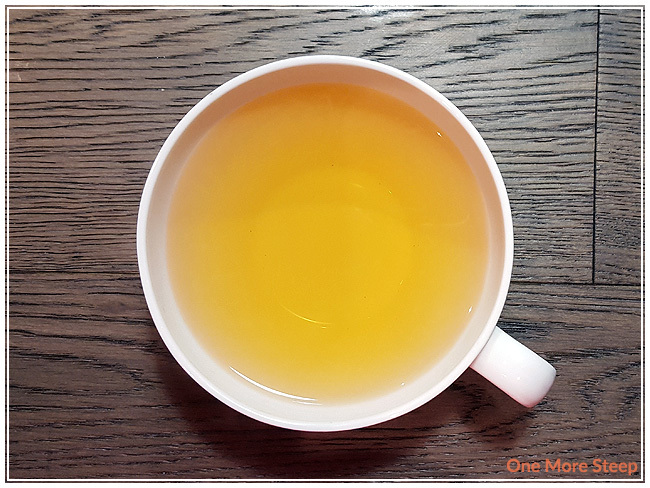 The shift from fruity to floral still makes this tea tasty though, and I found that Blue Ambrosia had a very sudden shift in flavour and still didn’t need any sweetener added to it to make it a delicious cup of tea.